This gardening experience has been so much fun. The kids have really enjoyed it. My son every morning and evening goes out to check the progress of our labors. He excitedly exclaims “there’s one!” as he finds the growing cucumbers. My husband checks things over and was the first one to notice the little ones growing on the vine. 1) No herbs grew. Not. One. That was a huge disappointment. I love, love, love cooking with fresh herbs and couldn’t wait to cook with ones I’d grown. It can’t get any fresher than grabbing it out of your very own garden! But, that hasn’t worked out for us. 2) Our volunteer plant. 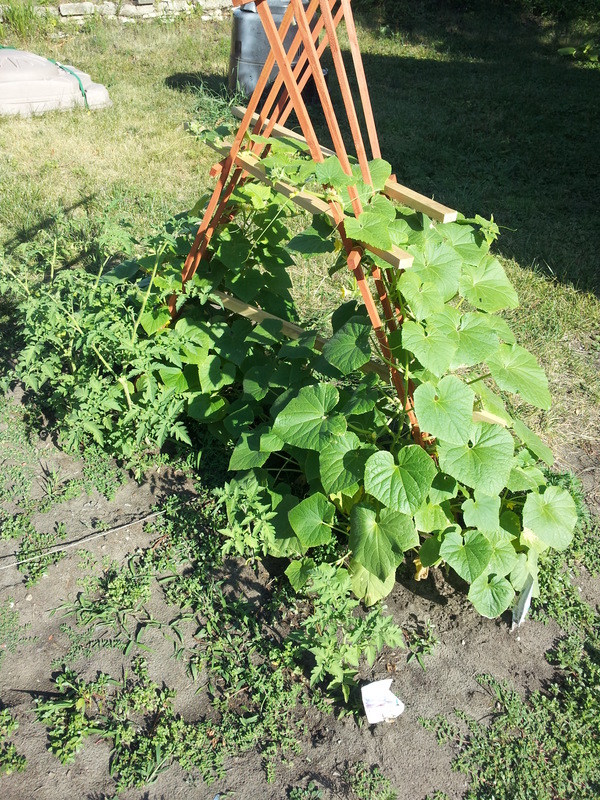 Now, it was great to have a volunteer zucchini plant from our compost pile. Downfall however it not only grew right over our onions but also got the grubs. Yeah, not fun. So, not only did several onions die/not grow but so did the volunteer plant. 3) Organic Seeds were a bust. The first time I went shopping for seeds I was with my sister-in-law. She’d favored organic seed and I didn’t have a preference. So, I purchased organic. I went back several weeks later and purchased a few more seeds. Luckily I did otherwise we’d have nothing in our garden. Yup, the organic seeds never grew. There are a lot of amazing things going on with our garden. Here’s a few of those. 1) Cucumbers galore! Oh boy did our cucumbers take off! 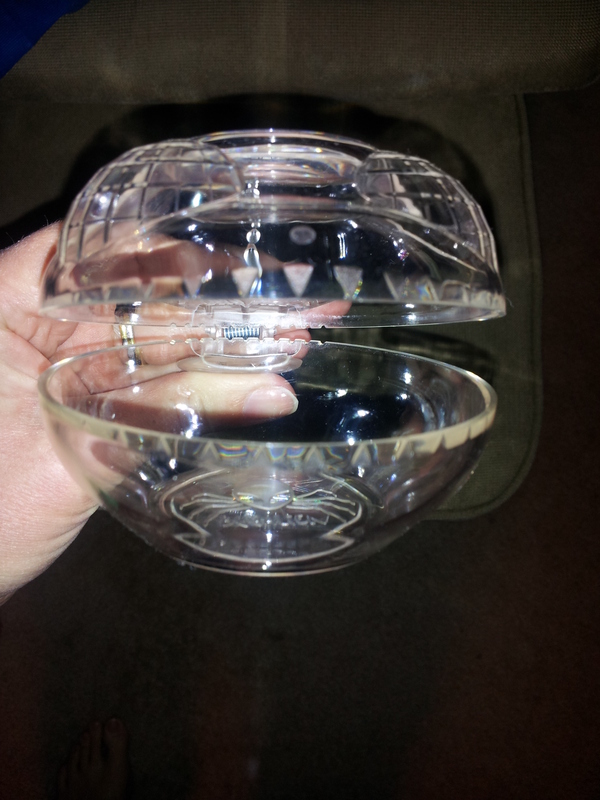 My husband is very much looking forward to some home-made pickles and I’m excited to try out canning this year! 2) Just enough tomatoes. We have 4 tomato plants right now. Two are quite small and are on the verge of the cucumber hostage situation become a complete take-over. The largest plant has a couple of green tomatoes on it. I’m certain the second to largest will have some soon with the smaller plants following shortly after. 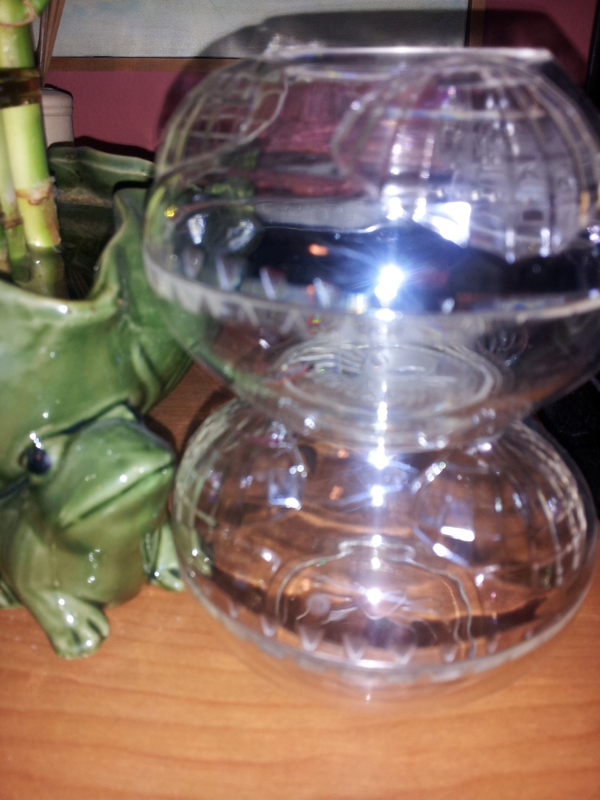 3) Watering is relaxing. I love watering the garden in the evenings. The sun is going down and I’m out there alone. The neighbors all retreated into their homes. It’s just me and my little garden. 4) Family enjoyment. 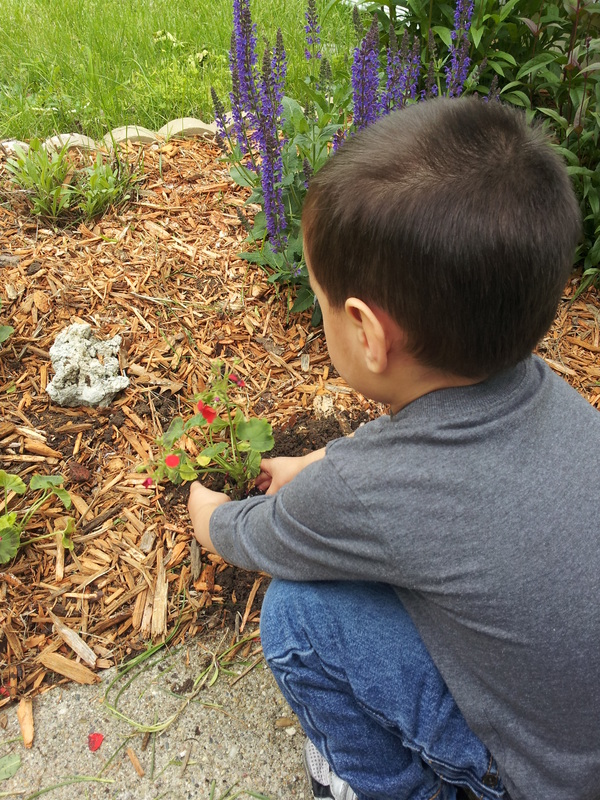 As I mentioned above, my kids love the garden. 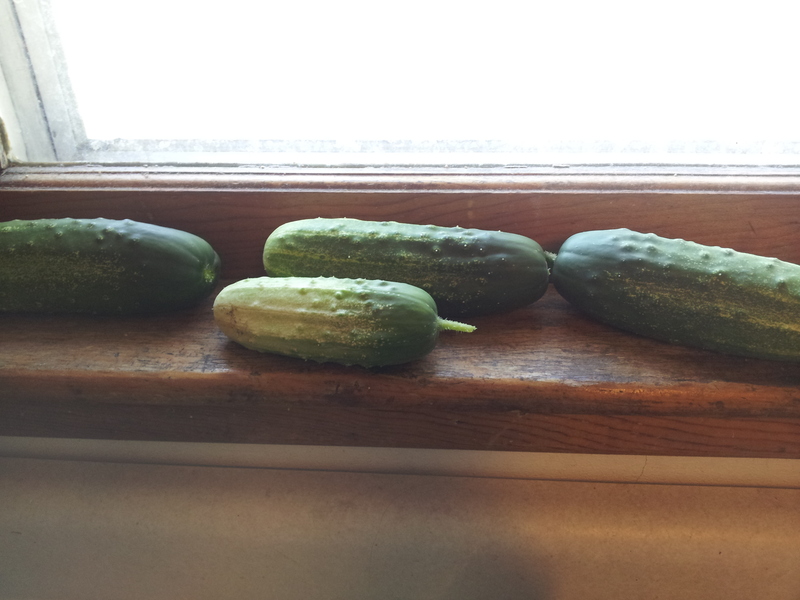 In fact last week when we picked our first few cucumbers, my son was a bit overzealous and picked one early. They squeal with delight as they look for more veggies on the vine. That enjoyment is priceless. 5) Educational opportunities. Growing the garden has helped with educational opportunities. Not only do we talk about the fun of growing our own food but the importance of doing it. We have the chance to add a little science to our life by discussing why worms are important to gardens. We’ve learned a lot this year so far with our garden. So much it would be hard to narrow it down and make a list. However, the top two things at this moment that I’ve learned is this: 1) it’s not nearly as difficult as I once thought 2) Joy of a garden outweighs any heartache (or body ache). How’s your gardening going? What challenges have you faced? What benefits have you received? I would love to hear from you! 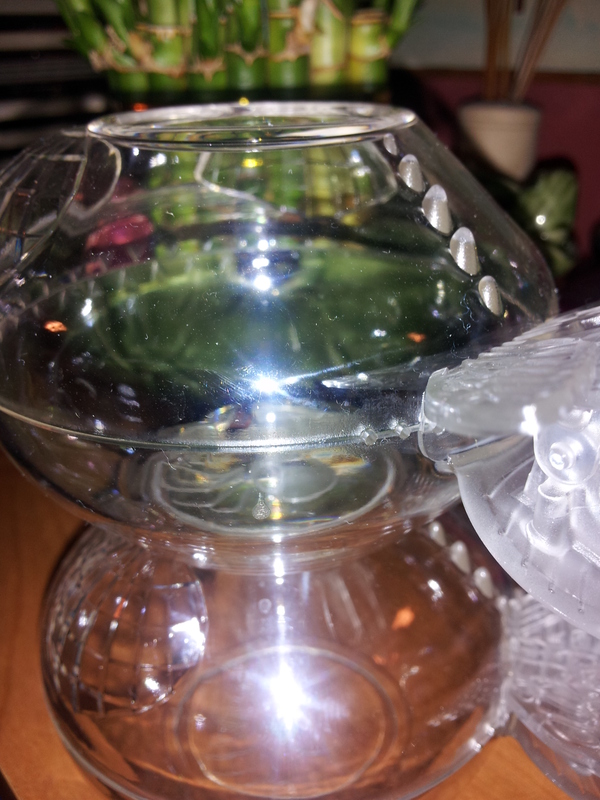 This entry was linked-up at Graced Simplicity. 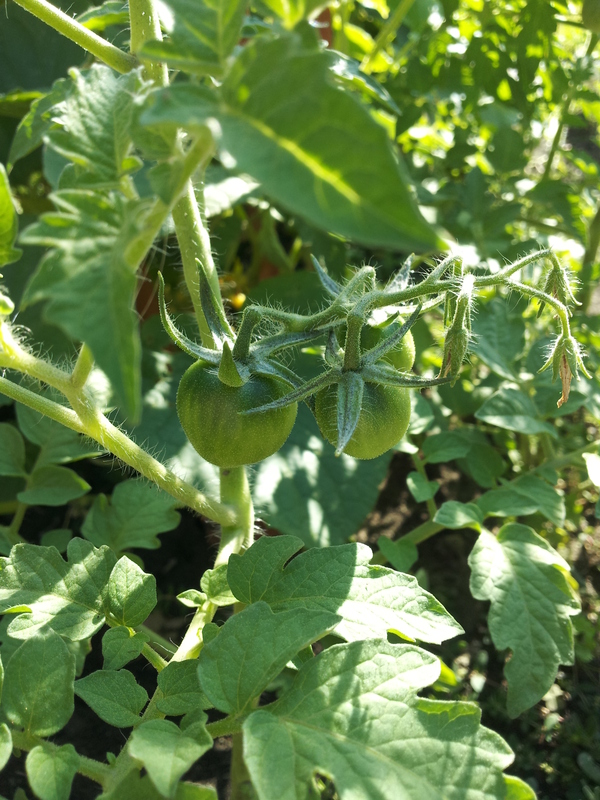 I’m having our first family vegetable garden this summer and its been an experience so far! We have a small plot, I’ve added in a few pictures below. I’ve planted carrots, onions, tomatoes, herbs, and cucumbers. I started this little project with a lot of excitement. We’d been putting off gardening because of our plan to move. Well, now that plan has changed and I insisted we not wait any longer to plan the garden. So, we have a family garden. My definition of a family garden is we all work in it. Now, I’ll admit, since it was my idea I’ve worked the most in it and anticipate I’ll continue to do the most work. And I’m OK with that. However, everyone will eventually get their hands dirty. The kids have already helped me with the digging and planting. My son was so excited and enthusiastic about it. 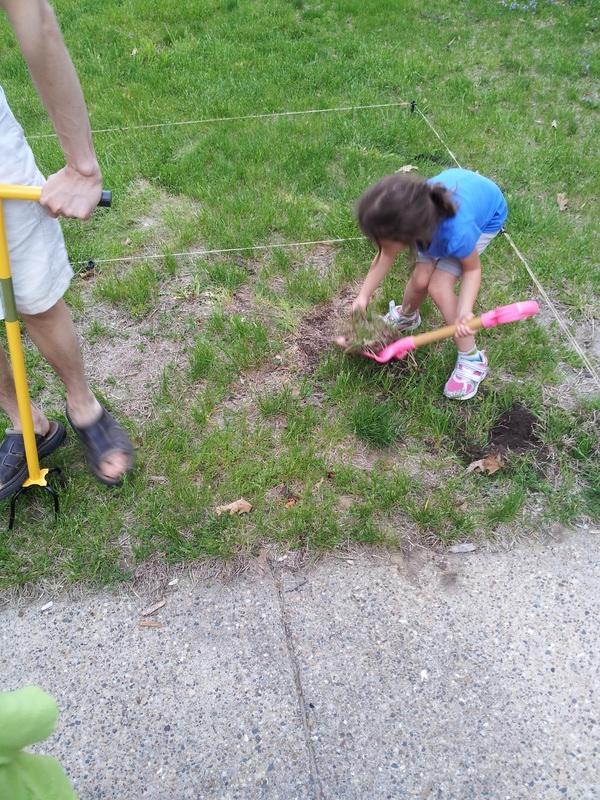 My daughter loved digging and pulling some of the weeds to get started but needed some encouragement to get her hands in the dirt. I’m really looking forward to summer time spent as a family in our garden. Since it was small plot, I didn’t want to pay to till the ground. 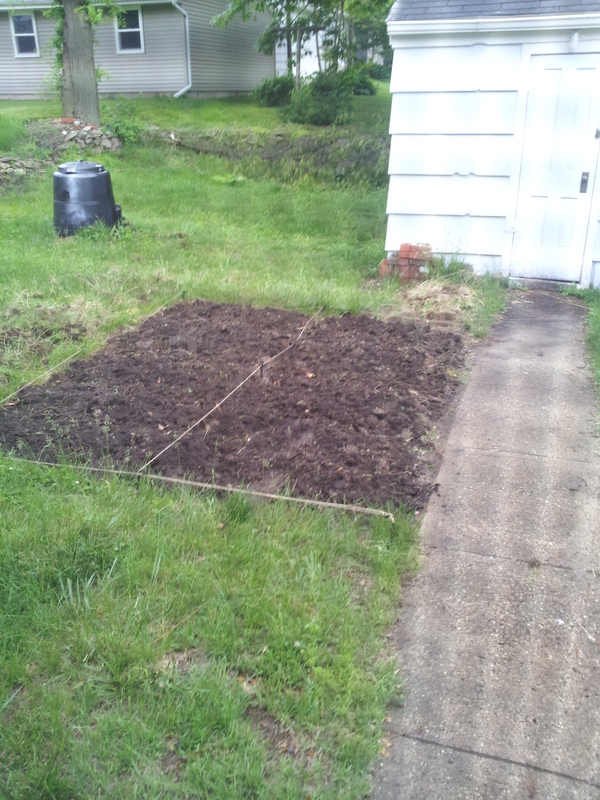 So, I bought a hand tiller and tilled it myself. Now that as a lot of work! Despite working out, my muscle felt a bit sore the next morning after tilling. The tilling and preparing the dirt took the longest. I was so gung-ho that the first weekend I managed to till 3/4 of the garden space. My enthusiasm slowed and it took an additional 3 nights and a weekend to complete the last 1/4. After the tilling was done, the rest of the planting went much easier. Since I tilled the ground over about a 3 week period (it kept raining on me! ), I had to go back over most of it to re-loosen-up the soil. After I did that, I spread some of our composit soil over the top and worked it into the ground. Ideally, I wanted to let it sit for a few days, but since time was not on my side. I let it sit for a day and planted the seeds the next day. The first picture is my daughter helping to shovel. 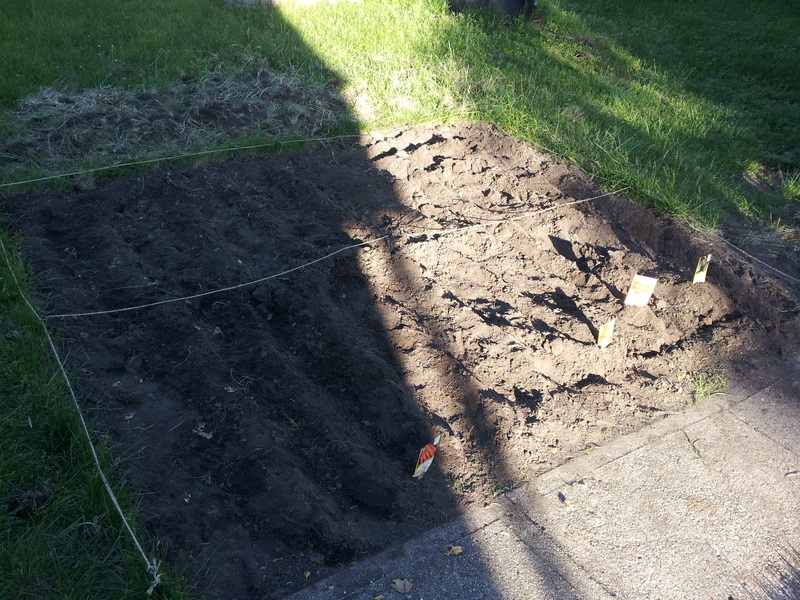 The second is the garden all tilled- by hand and the third is my son planting flowers. The fourth is the planted garden. Did you plant a garden this year? How did your planting time go? Is there a part of the process that seems like more work than another? We are on the verge of our first snow! The kids are really excited. I had to run out and buy them some snow boots last night. The fun part is that this isn’t just the first snow, but its a huge snow. Huge storm with 10 inches and a blizzard warning.This means one, we will have a white Christmas (yay!) and two maybe a snow day tomorrow. Well, for the kids. Since I work from home, there won’t be any snow days for me. This is the time of year I love snow. I love a white Christmas. For whatever reason, snow makes it Christmas. I think it stems back to when I was a child. Back when snow was magical and brought Santa and his Reindeer. I remember the smell of soup on the wood burning stove. I can still feel the heat that came off that stove. It’s a special heat, I’ve not found a heat quite like the heat from that old stove. The heat would engulf you like a giant blanket; giving you the warmth of your mother’s arms. A Christmas snow takes me back to when life was easy and fun. Back to a time when there was still some magic in the world and peace was as easy as snuggling up with a blanket and teddy bear. Oh, yes, Christmas snow is so refreshing. It adds a bit of spark to the holidays. So, for me, I’m excited to be celebrating an amazing holiday of grace and love surrounded by white, glistening treetops. I can’t wait to see the excitement in my children’s eyes when they see the snow!